A recent interview with anthropologist Alain Bertho lays out some key points from his new book, Le tempes des émeutes [The Riots Period], which brings together his ongoing documentation of insurrection, of "popular anger," or riots. Despite the lack of a clear political or social objective, the riotous eruptions around the world seem to Bertho to indicate we have entered an era of mobilization akin to momentous ones of the past. He likens the innumerable riots happening worldwide to "fissures of the globalized world." "Every fissure has its own history," he says, "but it's the whole house that's wobbling." 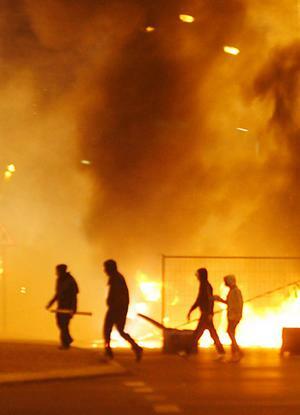 Is the riot a symptom of youth's relationship with politics, the "striking sign of its absence?" It's primarily a symptom of the contemporary world's relationship to its youth. The failure of the twentieth century's revolutions and the ecological threat have abolished the modern idea of historical progress, whether political or social. Youth is no longer considered the world's future, but as a threat to its present. Vis-à-vis youth, there is no longer any political discourse except for a disciplinary one. Youth reacts in consequence. In the whole world, college and high school student mobilizations, such as festive or sport-related demonstrations, are turning into ever more violent confrontations with the authorities. The same gestures and the same rage are present on every continent. Although we have seen protests of different calibers in the U.S., I wonder whether the U.S. makes it into Bertho's ethnography on riots. Without sounding too pessimistic, it seems as if people here have too many other outlets for their rage -- outlets which most certainly don't threaten the state. Read the original interview by Jean-Marie Durand on lesinrocks.com. Read the translated interview (by Leslie Thatcher) on truthout.com. Check out Bertho's website here. My students don't seem to carry around much rage these days. As long as they get their 'B' for showing up, they're happy to go home to their sports, video games, tv, and alcohol.